The investment banking recruiting cycle differs by bank but is generally the same time every year. First, let’s understand when everyone comes on-board. Full-time analysts start their career in the months of June and July and go through a two month training program learning the basics of financial modeling, financial statements, PowerPoint and Excel features. Interns will come on-board during June for a 10-12 week program. Internship training programs will generally last 1 week prior to start. During the last week of the summer internship program the banks will hand out offers to candidates they feel will make a good contribution to the team. Generally this is a majority of the interns (80-90%), there are some that will not make the cut. Full-Time Interviews: Generally Aug-Sept kicks off Full-time interviews for both undergraduates and graduate students. 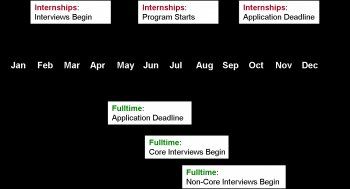 Full time interviewing differs by school, figure out if you’re a orcandidate will be beneficial here. Internships Interviews: Generally Jan-Feb kicks off summer internship interviews for undergraduates and graduate students. The smaller boutiques and middle market investment banks usually have a less structured interview process in terms of guidelines and dates. Boutiques in particular will usually hire on a need basis, so interviewing at these firms can happen all year around. If you find yourself behind the curve I suggest targeting the boutique and middle market investment banks.